RECF obviously knows this, and that’s why they’re taking steps to create other, alternate experiences that teams can strive for. They need to do this because the ugly truth is that Worlds is already completely out of reach for the majority of teams and that’s only going to get worse. Frankly, I think that’s mostly responsible for all the (what I will call) whining that’s been happening on this forum the past year or two. A lot of active forum users are on good teams who have gotten spoiled, essentially, by being able to qualify for Worlds every year. That’s getting harder and harder to do meaning these teams who are used to going aren’t always able to go anymore, and they don’t like that so they’re complaining. To be honest, most likely if I were a student in that position I would be too. I’m really sorry, but this feels like a personal attack. Most of the “whining” has come from me and a group of other highly competitive students. I can’t speak for them, but this is my experience with vex. I have qualified to Worlds each of the last 5 seasons, once as a state semifinalist, once as a robot skills state champion, and three times as a state tournament champion. I have had a record of 7-3 or better all 3 times I competed at worlds and 10-0 the one year I competed at US Open instead, and in each of the last 3 years, I have made division elims at US Open or Worlds as the 1 or 2 seed in my division. In 2017, I won my division at worlds. To say I have been “spoiled” to qualify to worlds is both factually inaccurate and offensive, and it undermines the thousands of hours I’ve put into my robots. The source of the “whining” has been the increased randomness vex has pushed or at least accepted, with changes such as bo1 and v5 white screening. Asking for basic fairness in matches that are the culmination of hundreds or thousands of hours of work is very different from whining about not qualifying to worlds. Worlds spots are a type of currency that RECF has, and they can choose to “spend” that currency in a number of ways. You are essentially advocating that they should spend that currency rewarding regions with really good teams. However, that doesn’t really further the RECF’s goals. Their goals are to get as many students as possible involved. Thus, they spend their currency by rewarding regions who are growing - because growing regions are reaching more and more students. You may not like this approach, but they’ve said pretty clearly that that’s what they’re doing - which answers your question “So in high school, why does Singapore get 3 worlds spots and 1 Signature Event in their entire continent, while California alone gets 40 spots and close to 10 Signature Events in North America?”. But this just creates a positive feedback loop. If you punish Singapore for not growing fast enough by removing their worlds spots, the teams in Singapore are less likely to want to compete, and there is even less growth. Then the RECF removes even more worlds spots, and even more teams drop out. It’s a great system for killing the program in slow growing regions. And the fact that growth is higher in the US? Maybe that has something to do with the outreach and advertisement Vex and the RECF do in the US that they fail to do internationally. They’re indirectly choosing which regions to “spend currency” on. When a team does well at worlds, it indicates that they have a group of smart and dedicated students, financial resources the RECF and Vex can profit from, and students that probably want to go into STEM. When every team from a region does well at worlds, they have a group of people who fit this description larger than the group that was represented at worlds. And if you allocate them more Worlds spots, more people are bound to enter the program. If you allocate those spots to US teams because even more teams registered and brought clawbots to a local competition than last year, you just end up with more of those clawbots at worlds. Sorry you feel that way. It is not intended to be. To say I have been “spoiled” to qualify to worlds is both factually inaccurate and offensive, and it undermines the thousands of hours I’ve put into my robots. 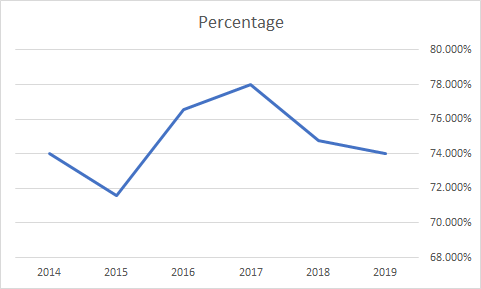 I don’t have exact numbers, but I’m fairly confident that the percentage of the number of Worlds spots versus the total number of VEX teams has decreased every year. Certainly we can all agree that that’s the trend, right? Thus, statistically 5 years ago it was easier to qualify for Worlds than this year. Go back further to the first local VEX event I helped to host, and I think all of the winners (and maybe finalists and/or other award winners) qualified directly to Worlds - from a ~25 team event. Clearly it was much easier to qualify for Worlds back then, no? Teams who are good and have been around for a while expect to be able to qualify for Worlds. Statistically, some of those teams are not going to qualify this year or in coming years. When you go from always being able to go to Worlds to not being able to go for the first time, it hurts. If you’ve never even been to Worlds and don’t really have realistic aspirations of going (which is probably 99% of VEX teams out there), then not qualifying doesn’t hurt so much. It hurts people like you more because you’ve come to expect it. That’s what I mean by “spoiled” and I’m pretty sure everyone here knows it. It is not at all a commentary on you or your team. Your argument about what a great record you have and that you’ve qualified the last 5 years just makes my point - you’re used to it. There’s noting wrong with that but it is clearly going to be more painful if you don’t qualify. Put another way, more competition to get into Worlds causes a mismatch of expectations. People like you and meng and others expect to go because you always have gone. Best of 1, reduced Worlds spots, skills qualification changes, etc. represent a risk to that expectation, hence you don’t like those changes. That’s normal. 10 years from now, if your team still exists, they almost certainly will not have an expectation of being able to go to Worlds, so when they don’t qualify they will not feel nearly as bad about it as you might. Also, since they have no expectation of going, they may view things like best of 1 in a much different way than you, preferring the positive aspects of that change because the downsides (increased risk of not qualifying to Worlds) isn’t much of a factor for them. And again, that already applies to 95% of VEX teams who already aren’t going to Worlds. In a few years I’ll have kids old enough to do VEX IQ. When IQ first started, I think all teams were eligible the first year for Worlds (or some large percentage of them). When I eventually start a team for my kids, the likelihood of them qualifying to Worlds will be nearly 0. They won’t care much because they won’t know better, but I’ll probably be very disappointed knowing they won’t be able to go. Seriously, it’s not an attack on you. You seem to go out of your way to take offense to everything I post, and frankly that’s getting tiring and offensive. If you punish Singapore for not growing fast enough by removing their worlds spots, the teams in Singapore are less likely to want to compete, and there is even less growth. RECF isn’t punishing anyone. Those spots do not belong to Singapore; they are not being taken away. Each year RECF has ~600 spots to give out. They look at the number of teams in each region, the amount of growth in that region, and probably some other factors. Using some sort of algorithm based on that information, they distribute those spots out to regions in the world. The number of spots a region gets in the previous year likely has little to no bearing on how many they get the next year. Singapore has 60ish teams and there have been comments on the forum here that suggested that Singapore isn’t very interested in growth. I’m certain no one in RECF wants to lose those 60 teams, but on the other hand, you can’t spend your precious currency (Worlds spots) on a region with a small number of teams and low growth when you have other regions that have 10x that many teams and are growing much faster (like California with ~1300 teams). California has about about 9.4% of all the VRC teams and gets 6.6% of Worlds spots. Singapore has about 0.4% of VRC teams and gets 0.5% of Worlds spots. If anything, Singapore is over-represented. That seems pretty fair to me, but I don’t spend much time studying this stuff or anything. I just ran a few other spot checks and most regions seem to be represented with a number of Worlds spots that pretty much matches their representation in VRC teams. I really don’t see how anyone can argue about that being unfair. But back to my earlier point: teams need to stop deciding if their season is good or not based on whether or not they go to Worlds. It’s unsustainable. Singapore, instead of expecting a large allocation of spots to Worlds (or being able to qualify a lot of teams through skills ), might want to focus on making a Worlds-like event in Singapore and/or choosing a Signature Event to be their focus. That would cut down on travel costs, make the goal more attainable, etc. which should make VRC a more rewarding experience for all the teams there. However, the comments I keep seeing about Singapore make it seem like that if they can’t have a similar chance of going to Worlds each year that they’ve always had then they’re not interested in VRC. If that’s the case, then maybe VRC isn’t for them, because it’s going to keep getting harder for everyone to qualify, not just them. Being a small region, there’s a chance at some point in the future they will have to combine with some other nearby region to even get any spots allocated. If you allocate those spots to US teams because even more teams registered and brought clawbots to a local competition than last year, you just end up with more of those clawbots at worlds. If more spots are allocated to a US region, it’s almost certainly because that region added a bunch of teams. Almost certainly, the number of spots in any region as a percentage of teams in that region will always be going down. Thus the teams that earn those spots will have to work harder each year to earn a spot, even if their region got more spots this year than last. Thus, I’m personally not the least bit worried about Worlds being filled with clawbots. We’ll have to agree to disagree on the chances of that outcome. No, people like Meng and me expect to go to worlds because we are better than the 6th best team in Singapore and the 40th best team in California, respectively. When you randomize this with bo1 and give worlds spots to teams that haven’t worked as hard or learned as much, this is a problem. If California was given 3 worlds spots, I wouldn’t expect to go to worlds because I’m not even close to the 3rd best team in California. Google defines “spoiled” as “harmed in character by being treated too leniently or indulgently.” If a team went 3-3 at states and qualified to Worlds on an excellence award because their parent was a judge at states, then went 2-8 at worlds, and then was angry they didn’t get the excellence award at states the next year when they went 3-3 at states again, that team would be spoiled. If a team was not given a fair opportunity to win a merit based award they deserved and denied a worlds spot based on that (8301D comes to mind), that is not an example of being spoiled. That is an example of being cheated by bad luck and not earning something you did deserve to earn. It is the opposite of spoiled. In my case, I am not being spoiled nor cheated. I am attending worlds this year, as I expected to, based on a performance based award I earned at my state event. I was given a fair opportunity to win this award and I have no complaints. And if I am 5-5 or better at worlds, it will be hard to argue that I don’t deserve my worlds spot. So when you call me spoiled for arguing that bo1 is less fair than bo3, yeah, that’s offensive. And now you’re offended that I’m offended? That’s just kind of silly. How many spots does your region’s IQ program get? If your kids built a robot that is the nth best in the region and the region gets more than n spots, and they lose because of something they can’t control, they have every right to be disappointed, and so do you. Anyhow, we’ve strayed pretty far from the main topic. Is there a legitimate reason not to host more Signature events in China and Singapore? If not (and there’s not) then I think hosting more Signature Events in these countries could improve the Signature Event experience even more. Agree? Disagree? Let’s talk about it. Thank you for putting all this effort into this thread. As a mere Freshman student, I don’t feel as if I can contribute as meaningfully as some of the other big names around here can, so I won’t try to. I didn’t expect to go to Worlds this year, but it is my ultimate goal to attend at least once. But I don’t threaten myself to quit robotics if I don’t. Once again, thanks to all who are participating in this discussion. It’s important to sort out what (at least) this subsection of the VRC community thinks about these issues. wow… I woke up and saw all these posts. @Dave_Flowerday guess I am one of those in your list of spoilt whiners. lol. Well… to all those who might still not be aware or notice - my “whining” is my last bid attempt to keep VRC alive in Singapore. I have been in VRC since Elevation (and of course, in robotics much longer than that). I do love VRC. I like the focus of VRC as compared to FIRST - more about robots, more (relatively) affordable, structured, a long enough season for me to use as a tool for my robotics club, etc. In the initial years, there was a push for the international teams. That’s when the number of china teams shot up and even in Singapore we had a peak of about 80+ teams. I do understand that all organisations will need to review their mission, vision, strategic plans from time to time. And that’s why I mentioned in my earlier post that RECF has done nothing wrong and it is up to the international teams to decide if they still want to continue with RECF’s new direction. Think no one can deny that worlds is increasingly becoming more and more US-centric. One might say that it is only fair - going by the number of registered teams in the respective regions. But there are so many factors involved when we are talking about growth, in fact, it is the rate of growth that we are looking at. It is just too simplistic to look at the number and say - it is fair. Fairness and equality is when everyone has equal access and has a fair chance of qualifying for worlds (since the context is about making it to worlds, then I will use this as the end goal). So in this sense, is it really equality at work? This notion of equality then leads to the next point - the notion of meritocracy. In the earlier years of VRC, there was this sense of meritocracy. It doesn’t matter where you are from, if you are good enough, then you deserved to be in worlds. The focus was more on robots’ performance than other judges’ awards (except for excellence and design - which have always been highly regarded). But nowadays we are hearing so many “whining” about the unfairness of the judges awards, the focus of worlds seems not to be looking for the best robots, etc. I would like to think skills challenge or worlds qualifications via global skills ranking is meritocracy at work. I really think the root of all these could be traced to this issue at heart - is RECF and VRC still holding meritocracy as their number 1 priority? (or maybe it has never been… I wouldn’t know… since I was not in the discussions with the founding members). The “Singapore Issue” - it should be renamed as the “Small regions issue”. In another post quite some time back, I tried explaining why for Singapore, and also the smaller regions, it is so difficult to grow. The constraints that we have etc. I am not going to bore all of you with the details again. Just to simplify the entire thing - let’s just remember Singapore is smaller than LA or NYC or HK. And now throw in the government’s changed in policies regarding schools going overseas and pragmatic approach regarding KPIs, etc. it is not difficult to see why schools would rather opt for easier options (i.e. competitions that allow them to go for international level tournaments easier). Another example I can think of will be Hawaii. No matter what you do, there is only so much they can grow. But is it fair to expect them to grow as fast as the rest of the states? Every small regions has their own set of unique constraints. By default, nobody wants to remain “small”, but there must be some unique situation that caused them to remain small. So let’s not just brushed aside the small region issues and say - you guys are just lazy… just go and grow your region instead of whining. Right from the beginning, the yardstick used is already unfair to the smaller regions. I have never exactly whined about the number of spots allocated to Singapore. Even when they cut it down to 1 spot few years ago, I just accepted it and won the spots via skills challenge. That’s because I do understand the rationale behind all these changes by RECF. All I am asking for is a fair chance for my teams (and those from smaller regions) to qualify for worlds (am I still asking too much? ), and signature events is not a fair chance. The idea of giving kids the “worlds” experience without going to worlds is great. But the idea of using them as a worlds-qualifying opportunities is bad. I would rather have the signature events as the 2nd-tier worlds events, something like US Open. So even if the teams couldn’t make it to worlds, they can go/qualify for a signature event. It will still be a great experience and end goal for all the teams. Think I will keep the future plans of 8059 in a separate post… nearer to worlds. I am 90% sure it will be our last worlds and involvement in vex. No hard feelings here… I am old enough to understand things and situation evolved. No matter how long we have been involved or like the programme, when it is time to move on, then we just got to move on. But @Anomaly - thanks for speaking up for us. really appreciate it. And do drop by during worlds to take a pic!! By those numbers, Worlds is becoming slightly less US-centric each year (granted, not by a lot), and US teams are under-represented at Worlds compared to their representation in the overall VEX population. I’m sure there’s other ways to measure it though - so anyone have suggestions on what they are? So, if you’re running the RECF and you have 600 spots to allocate around the world, how do you specifically decide how many spots go to Singapore? What would you do that you would consider to be fair? Again - genuinely curious. From what I can tell, the number of Worlds spots allocated to each region seems to correspond pretty closely to the percentage of all VEX teams in each region - which comes out to something around 1 Worlds spot per every 20-30 or so teams in a region. You repeatedly referenced fairness, so it seems reasonable to conclude that you don’t think the current allocation is fair. So what would be fair in your mind? I am replying off my mobile phone… so I can’t dig any data out. I am sure the earlier years of worlds have even more international teams. Like I said as well… if we are only looking at the number of registered teams (which you are constantly referring to), then yes, the allocation is fair. But how about adding a performance matrix or index to it? This will be quite similar to FIFA world cup allocation. E.g… if the region is top 5 in win percentage in the previous worlds, add 2 spots. I do agree that the other extreme of basing allocation purely by performance (e.g… skills scores) will be… well… too extreme as well. And since this thread is about signature events, how does signature events being translated to fair chance for international teams? It doesn’t. But it does create more chances for US teams though. Ironically, if I were the RECF & trying to be “fair” to powerhouse players who might be from small regions that might not get allocated a lot of spots, I would probably set aside some small amount of those 600 spots and somehow leave them “up for grabs” by anyone dedicated and talented enough to get them in some overall non-judged test of skills / performance (regardless of what region they were from and not requiring them to have the funds/time to go to special events)… Lol. I think the Signature Events are an interesting idea - but, aside from local participants, they clearly favor the teams with lots of funds and time available (with those farther away getting hit the worst, of course). The teams plan to attend 2 very expensive multi-day events (assuming that they are planning on trying hard to win the Sig Event and get a bid to Worlds, which I also assume they would then plan on attending) in addition to probably attending their own Regional / State event. Even traveling in the cont US, that adds up! The Signature Events also suffer from the same issue as regular events: you can do everything in your power to have a robot that performs well and a drive-team with great talent, you can know the rules inside and out (and try to get your Q&As answered), you can independently master the skills side & be able to consistently score well there - but you still can’t pick your qual partners or opponents and you can’t guarantee referees will see things your way on rulings. I’m sure many teams have, at some time, been in a qual match with a partner who doesn’t move & 2 high-level opponents or been in one where a ruling didn’t go your way. Skills is an independent test of ability and something more directly in your control. It’s also much more time and cost efficient. I’d personally rather the Worlds Skills top 1 or 5 get a bid than the Online Challenge teams get a bid… isn’t giving them robot money plenty of an incentive for something that doesn’t really involve robots? Should you really be able to register a team, not even be required to compete with (or even build) a robot, and still get a Worlds bid? The approach for qualifications to worlds is a spectrum. On one extreme, it will be purely based on performance, and the other extreme will be purely based on growth. With the global skills ranking, it was a combination of growth-based and performance-based. Not perfect, I personally thought it was quite a nice sweet spot. Now with the removal of global skills ranking, allocation is purely by growth. Side note: If one is to think about it, it is rewarding the EPs, and not the students. What i mean is that how much the region is growing is mainly due to the EPs’ effort. As contrast to performance based, it will be due to the students’ performance. It is obvious that I am not for an allocation system that is purely based on growth. There should be room for performance to be factored in. And since there is no more (worlds qualifications via) global skills ranking, I would suggest we look at the region’s performance at worlds? Maybe… the top 5 regions will get 2 additional spots for the next season? And then the next top 5 will get 1 additional spot? Of course, we will need to see if RECF is able to “spare” these 15 performance-based spots. In this manner, we will be rewarding the students’ performance directly and also giving the students a greater sense of purpose - they are not just fighting for themselves, but for their region. And it might even help to achieve greater collaboration between teams within the region (during the pre-worlds period). Actually… I have already gone off-tangent from the thread. It is not about the allocation of spots or small regions issues. Now I don’t think Dave_Flowerday was intentionally trying to misrepresent the data, but I could have easily chosen to state the percentages of 2015 to 2017 if I were trying to prove the opposite point. While the trend Dave_Flowerday was portraying may be true, when you factor in the years left out, it becomes much less linear than it was portrayed to be. Here’s a link to the excel workbook I used: https://1drv.ms/x/s!AjytYVUs2jFFhnJ_Dq6R2dVv78No. I threw it together pretty fast, so I could have made a mistake somewhere. Let me know if anything is wrong. Also, let me know if anyone has the team lists for 2013 and earlier. I’m not sure what data source you’re using as your numbers for 2016 and 2017 are higher than what I have (and 2015 is a shade lower), and I was using the team lists that were used by TM to generate the match schedules for each year so they should be quite accurate. I just randomly picked the 3 years I used because those years I already had readily available. My point wasn’t so much that the numbers were going down, but that they’re not trending up. The claim was “no one can deny that worlds is increasingly becoming more and more US-centric” and I don’t know how to quantify that other than to look at the percentage of US teams at Worlds, and looking at those numbers I certainly don’t see a trend that would support this claim. The numbers of US teams seems to have remained relatively steady around 75%, and 2018 and 19 are lower than 16 and 17, which, in my opinion only, refutes the claim that Worlds is becoming more US-centric. For the chart you posted, I think it would be more representative if you scaled the Y axis to be 0-100%. Your chart appears to show a huge variation, when in reality the total variation is pretty low, only around 6% (with your numbers). The more interesting comparison would be to look at the percentage of Worlds teams from the US versus the percentage of US teams in the total VEX team population for each season. Unfortunately I don’t think I have that historical data. edit Here’s the image, scaled for the full range of 0-100%. Always interesting how the exact same data can look so differently. That’s always the big problem with stats. Thank you for the clarification. As for the numbers I am using, I just scraped it from the robot events team list, such as this one here https://www.robotevents.com/robot-competitions/vex-robotics-competition/RE-VRC-17-3805.html. If you look at the excel sheet you can see exactly how I calculated each percentage. Also, I was primarily responding to your statement that “By those numbers, Worlds is becoming slightly less US-centric each year (granted, not by a lot)”. With what you say now, I would agree that the data does not show a clear a trend either way, so thank you for the clarification. The full graph is also helpful, I just posted the one auto-generated by excel. I don’t want to take a stance on the issue either way, I just wanted to fill in the gaps of the years you provided. That is another big problem with stats, only providing a fraction of the available data. Edit: I also think it would be cool to see the percentage of US teams in the total VEX team population, so if anyone has data such as a full list of teams each year, I’d be happy to crunch it in excel and make some new graphs (correctly scaled this time). Here is a sheet of all Worlds team lists from 2010-2019 and also 2008. I couldn’t find 2009 anywhere. I certainly don’t want anyone to accuse me of selectively picking and choosing data, so I spent some time (more than I’d like really) to pull together everything I have. Nothing to hide here. 2008 is a big outlier - that was the first year of VEX Worlds, and was part of the transition from FVC/FTC to VEX. Most US-based teams would have still been doing FTC that year I believe, so I think that accounts for the much lower US percentage. Everyone can draw their own conclusions from the data. 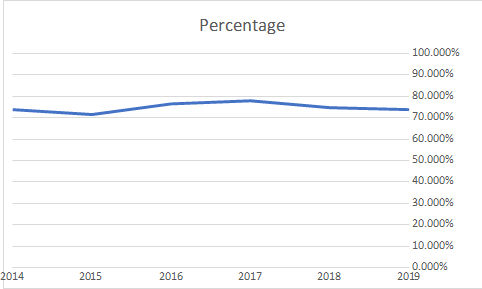 If you fit a line with the 2010-2019 data, you see a very slight upward trend in the US percentage. However, that’s entirely due to 2010 being the lowest value. If you look at 2011-2019, the line is basically flat. While I think the data is always interesting, it’s probably dangerous to read too much into it. Back in 2010 it was exceptionally easy to get into Worlds I think - even tiny local events qualified multiple teams to Worlds. Thus, I doubt there were too many teams who wanted to go to Worlds back then who weren’t able. In addition to qualifying, teams were probably able to just waitlist in and get in as well. I understand what you’re getting at with this. Do we really know that it’s allocated by growth though? I recall Paul saying something about growth being factored in, but I have no idea how or by how much. From what I could tell, spot allocation corresponds more or less to the percentage of teams in the region to the globe. So, I’d say more that “allocation is done by proportion of teams in the region to total teams in the world” which isn’t quite the same thing. I understand why teams would like to see allocation by performance. Honestly (and I have no skin in the game; I’m not a mentor or student on any team), I was a bit surprised and disappointed as well that the global skills qualification was eliminated. I always thought that was a nice differentiator versus other programs. However, I take at face value the comments from Paul and others that global skills was meant to be temporary, and that there was excessive cheating there. I also strongly disagree with the assertion that “simply” requiring all skills runs to be recorded is a solution, as do most other EPs that I’ve heard from. Furthermore, while I think it was nice to award some spots based on skills (making skills important in the overall VRC progarm), I do not really believe that skills proficiency is a perfect proxy for team performance - it’s possible to be a great skills team without being that great at alliance matches and vice-versa. Skills is really a separate game. Clearly, great skills teams are almost always going to be good alliance teams, but if taken to the extreme I don’t think that giving out Worlds spots exclusively by using the global skills rankings would mean that the absolute best 600 teams would be at Worlds. What I’m getting at is there’s no perfect way to decide which teams globally are the “best” in order to invite them to Worlds since most teams never play each other directly. Instead, the world is divided into regions, those regions play tournaments and state/national championships to decide who is the best in that region, then worlds pits all the region winners against each other (more or less). The teams that are qualifying to Worlds are still doing so by performance - just performance in their region rather than globally (modulo some teams that qualify through awards). Side note: If one is to think about it, it is rewarding the EPs, and not the students. What i mean is that how much the region is growing is mainly due to the EPs’ effort. There’s nothing stopping teams/students from recruiting new teams. This is really emphasized in FRC but not so much in VRC. I personally don’t like the FRC approach as it starts to seem a bit cult-like to me, but if spots are allocated by % of teams, then recruiting new teams is one way to try to gain more spots. However, the point I’m really trying to make is that teams should stop focusing so exclusively on Worlds. Make your state/regional championship be a Worlds experience. Most state/regional championships are probably already bigger events than Worlds was 5-10 years ago anyway. I fully understand that going to States will never be quite the same as Worlds. But, it’s much more achievable. And, for international locations, it should be way more cost-effective. That’s interesting, and already happens a little bit I think - aren’t previous Worlds winners auto-invited to the next year’s Worlds? But really, I’m going to say it again even though I know almost everyone here hates it: stop focusing so much on Worlds. If Worlds is someone’s only goal, they are very likely to be disappointed. Hopefully teams will start wanting to go to Signature Events because those events are great on their own, not because it gives them a little more chance to qualify to Worlds. I’ve heard a lot of teams loved the Kalahari event last year and I think that was the inspiration for Signature Events this year. Hopefully Signature Events do a better job of making the event a “big show” and being fun and competitive. Hopefully they are more fairly distributed around the world (I believe sig events were open to application - is the lack of international sig events just because few international events applied? I have no idea, just curious). Do we really know that it’s allocated by growth though? I recall Paul saying something about growth being factored in, but I have no idea how or by how much. From what I could tell, spot allocation corresponds more or less to the percentage of teams in the region to the globe. So, I’d say more that “allocation is done by proportion of teams in the region to total teams in the world” which isn’t quite the same thing. Ok… when I said it is by growth - what I really mean is the base allocation is the number of teams in the region + additional spots for fast growing region. But regions’ performance is not factored in, i.e. it does not take into account of how well the teams are performing in the region. However, I take at face value the comments from Paul and others that global skills was meant to be temporary, and that there was excessive cheating there. I also strongly disagree with the assertion that “simply” requiring all skills runs to be recorded is a solution, as do most other EPs that I’ve heard from. Firstly, when skills ranking was started, I don’t recall anyone from RECF actually said it was only temporary or they set a sunset clause to it. Again… I was never in the room when all these discussions were taking place. But do anyone recall this was ever mentioned? The first time i heard about skills ranking being temporary was only via the the post made by Paul. Secondly, don’t think “cheating” was ever mentioned by Paul, think it is more towards “encouraging bad behaviours”. And no one want to elaborate on exactly what are the bad behaviours. We can only speculate that it could be plate-switching? But that’s the area that mentors should be able to put a stop to it. but if taken to the extreme I don’t think that giving out Worlds spots exclusively by using the global skills rankings would mean that the absolute best 600 teams would be at Worlds. Think I have also clearly mentioned that purely performance-based allocation is too extreme as well. And it should be clear that I am in favour of a combination of growth (or number of teams in the region) based + performance-based. But honestly I am not sure how many teams did the students start on their own? Private teams perhaps. But not a lot. And I would think that most of the time recruitment of new members are for existing teams, and not so often to start a brand new team. So if you are talking about growing a region, it still falls mainly on the EPs’ and mentors’ lap. I sent my students out every week… to other schools to do coaching and mentoring, hoping to inspire them enough to register as a new team. But so far the school admins (of other schools) will still rather not put in the investment. So yes - we have not been lazy or just sit around and do nothing (as some ppl might think we are). There is a simple truth of saturation point. Singapore has only 18 junior colleges (our high school equivalent)… and that’s including all the special schools that integrate middle and high school years. Just curious… how many teams do we think we can reasonably squeeze out of 18 high schools? Yes… winners are already automatically invited. But that’s even before, during and after skills ranking era. And why not expand this concept as well? And there is no positive feedback loop - it is not supposed to be accumulative. It will just add on to the base allocation. eg. If Region A has a base allocation of 3, and it was in the top 5 region last season, then it will have a total of 3 + 2 (as I said, this number is just used as an example) = 5. And it will be reset back to the base allocation of 3 for the following season. Don’t think it will ever be a positive-feedback loop. But I do agree - it is difficult to compare the performance of a region of 1 team versus a region of 10 teams. We will need to normalise the data before we can use it as a proper index. But really, I’m going to say it again even though I know almost everyone here hates it: stop focusing so much on Worlds. If Worlds is someone’s only goal, they are very likely to be disappointed. Hopefully teams will start wanting to go to Signature Events because those events are great on their own, not because it gives them a little more chance to qualify to Worlds. I am not sure if I can agree to this… as an educator and mentor. I am not ashamed to say that my club set high goals… we aim to be, and work towards being world champion ( we believed in the 10 000 hours rule). We subscribed to what “Good to Greatness” mentioned - set Big Hairy Audacious goal. But no… we don’t expect to be world champion (we have not ever won one anyway)… but we should aim high goals for the students. As always, many of my teams couldn’t qualify for worlds every year, they learnt to deal with failures and disappointments and try to come back stronger and aim to be world champion in the next season. I don’t think it is wrong to set your goal to go for worlds or to be world champion, and it is also not the same as expecting to be one. Personally I don’t think it is right to ask the kids to lower down their expectations so that they won’t feel so disappointed. We should always ask the younger generations to aim as high as they could… and teach them to manage disappointment and get stronger. But to your point about making signature events as the end goal - think it is similar to what I propose about signature events - don’t make them as a worlds-qualifying event, but instead make them to be the 2nd-tier worlds-like event. This will allow more students to get inspired and also have a great end-season experience. Currently I am on VexU team EKSDE1 and qualified for Worlds at our first regional this year, so signature events don’t really concern me. Last year I was on 8675A better know as Fuzzy Wuzzy 2.0 and we were ranked in the top 10 in global skills, so we qualified off of skills. Now we also double qualified for Worlds at State. As a team from Nebraska the closest Signature Event was in Ohio, so it would have costed us more than US Open to compete there. Personally I like the idea of Top skills qualifying and Signature Events qualifying teams, but IMO they both could use some improvement. I am going to talk from the HS perspective. So for skills I think a Top 10 qualify for Worlds would make sense. I don’t know how possible this is, but maybe EP’s would be required to submit a video of all skills scores for them to be validated so scores cannot be fudged. This would help teams that cannot afford a Signature Event have another chance to qualify. As for Signature Events this is how I think it could be improved. Speaking on the US side of this Signature events should be equally spread out geographically. Maybe the US could be divided into Regions and each Region gets one Signature Event. These Regions could be made so that teams would be within one days drive of a Signature Event to bring down cost. Also I believe that Signature Events should not be held in the same location every year so that it can be closer to some teams and to give teams new experiences. I imagine my ideas are not perfect, but I think there is some improvement that can happen in how teams can qualify besides State competitions. This actually is a pretty good idea, and other programs have done something similar. For a few years, FTC used to do Super Regionals because their Worlds were capped at 128 teams total. So they’d have 4-5 Super Regionals in different parts of the country for teams to go to. RECF could do something like this. On the USA Side, this is very doable. Events like NATM, Kalahari, WPI, Google, USF were all geographically dispersed well. The only issue is with international teams and events internationally. There’s no easy way of distributing it to make travel easier for all international teams. Yeah I don’t know how to solve the international problem, but really haven’t given it much thought either. The Top 10 skills qualify would somewhat help international teams. Really top skills shouldn’t have gone away in my opinion to begin with, but oh well. I’ve slogged through most of this and have concluded that the Signature Event should be that, a Signature event, and not have a path forward to Worlds. All adding 30 signature events did was create 30 mini regions that have more bids to worlds than Delmarva does. The way it was explained to me and the way I think it should work is to give roboteers a “World like experience”, but closer to home to limit the expense. STEM Robotics is supporting two IQ teams going to worlds, overall cost for the 4 families and the robot approaches $9K. Last weekend we held an “Unofficial Signature Event ™” with table coverings on the pits, table coverings on the 9 raised IQ fields, decorations, balloons, a two hour visit by the Governor, one of the senators drove in a display match, bomb squad robot played (stacked hubs on the field while reaching from the floor), etc. Total cost was about 1/3 of sending two robots to Worlds. Inspired 163 roboteers and over 3 dozen soon to be roboteers (we gave third grade and below “Future Roboteer Shirts”), and gave trophy’s out to the top 5 teamwork alliances and a handful of judged award. So I think Signature Events are great idea, but I’d like to see regions get the signature spot back. Maybe minimal level needs to be 4 (Excellence, the two event winners and Robot skills). Then divide the rest up by size. That would help Meng and it would give Idaho a big boost in drawing new roboteers.